When ammonia strikes, you might not notice anything out of the ordinary except sick fish. Like an invisible assassin, ammonia seemingly shows up out of nowhere and often deals a fatal blow to your fish. Preventing an ammonia buildup calls for two layers of defense; cycling your tank so beneficial bacteria have a chance to dispose of ammonia and reducing sources of ammonia. While beneficial bacteria keep ammonia in check under normal circumstances, the little organisms can't compensate for a lack of cleaning. All kinds of junk -- from fish waste to uneaten food -- accumulates in the tank and can lead to increased ammonia levels. By changing out 20 percent of your tank's water weekly, you remove these ammonia sources and replenish the tank with fresh water. You can do this with a siphon. If you have a gravel substrate, push the siphon into the gravel to remove all the nastiness that accumulates deep beneath. If you have a sand substrate, vacuum up only what lies on top. When fish and other aquarium inhabitants die, you need to remove them as soon as possible. Once dead, they begin to decompose and can cause an ammonia spike, especially if you have a smaller tank. Consider counting your fish at least once a day to ensure they're all healthy and present. Plants that wither away and die can also negatively affect ammonia levels. Clip off dead sections of plants or remove the unhealthy plants entirely if they aren't bouncing back. 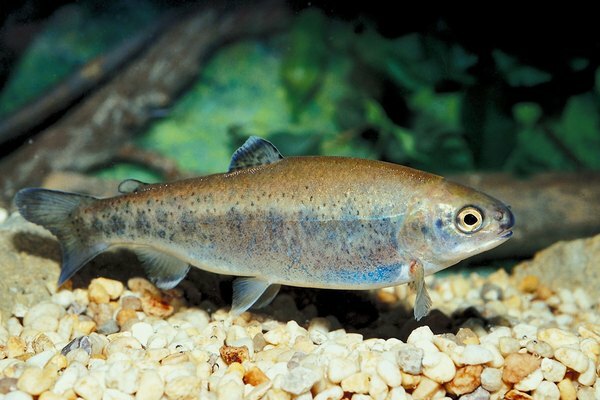 As a general rule of thumb, a fish's stomach is only as large as its eye. Take that into consideration when you sprinkle in flakes, frozen or live food. Many fish will over-indulge if given the chance, which can lead to bloat and other deadly disorders. The food that the gluttonous swimmers don’t consume gets buried in the substrate and decomposes, increasing ammonia in the water. You'll probably come across information that suggests feeding your fish as much as they can eat in two minutes or five minutes or some other general span of time. The problem with that advice is that every fish and type of food is different. Suppose you feed a betta blood worms. He should only eat three to five blood worms in one day. In two minutes, he can finish off far more than that and could become sick. Research your specific fish and the type of food you feed them. Your tank can only accommodate so much fish waste, an amount that largely depends on tank size and filtration setup. It's impossible to generate a fixed figure for how many fish you can stock in your tank. Plenty of online tools help you estimate that number, but thorough research is your best option. Every aquarium inhabitant produces a different amount of waste, so going by a fixed number -- such as the often mentioned 1 inch per gallon -- is flawed. If your tank isn't properly cycled, nothing you do will keep ammonia levels down until enough beneficial bacteria grow. To avoid losing fish, opt for a fishless cycle. This involves setting up your tank like normal -- filter, filter media, substrate and so forth -- and adding enough pure ammonia every day so that the ammonia levels reach 4 or 5 parts per million. In an article for FishChannel.com, former marine biologist Neale Monks suggests gauging how many drops of ammonia you need to bring a 3-gallon bucket of water up to 4 or 5 parts per million. You can then multiply that number to match your tank size. Monks goes on to suggest you test your water 12 hours after adding the ammonia and notes that if ammonia and nitrite levels both read 0 parts per million for seven days in a row, your tank is cycled. You can purchase testing kits that test for ammonia, nitrite and other water parameters at most pet stores. NippyFish.net: What Should I Feed My Betta?